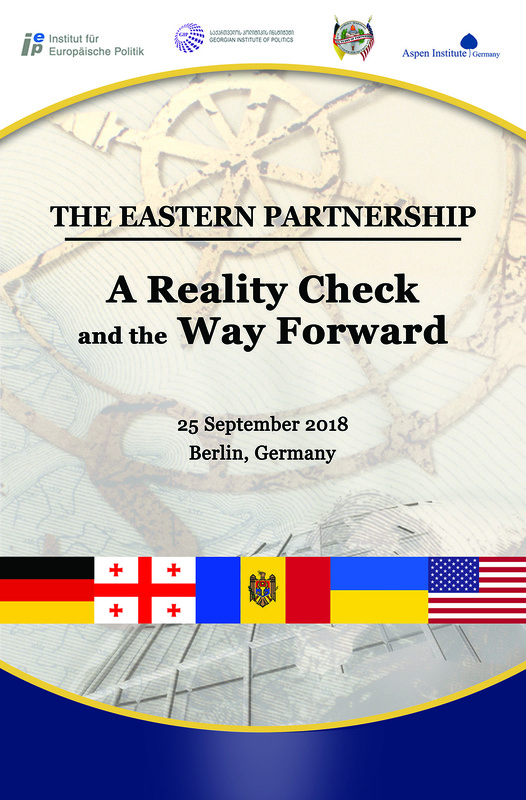 The Georgian Institute of Politics, the Institut für Europäische Politik, the George C. Marshall Center and the Aspen Institute Germany jointly organized a public discussion “The Eastern Partnership – A Reality Check and the Way Forward”, in Berlin on 25 September. The event brought together more than 80 participants, including the members of Parliament and representatives from civil society organizations from Georgia, Moldova, Ukraine, Germany and the U.S. to discuss the current state of affairs regarding the Euro-Atlantic integration process of the respective countries, and to share their views on the future of the Eastern Partnership. In their opening remarks, delivered by Rüdiger Lentz (Executive Director of the Aspen Institute Germany), Dr. Andrew Michta (Dean of the College of International Security Studies at George C. Marshall European Center for Security Studies), Dr. Kornely Kakachia (Director of Georgian Institute of Politics) and Dr. Katrin Böttger (Director of Institut für Europäische Politik), all stressed the importance of We need policy dialogue between the EaP countries and their Western partners, to recognize and address the needs of people, and build resilience in the region. 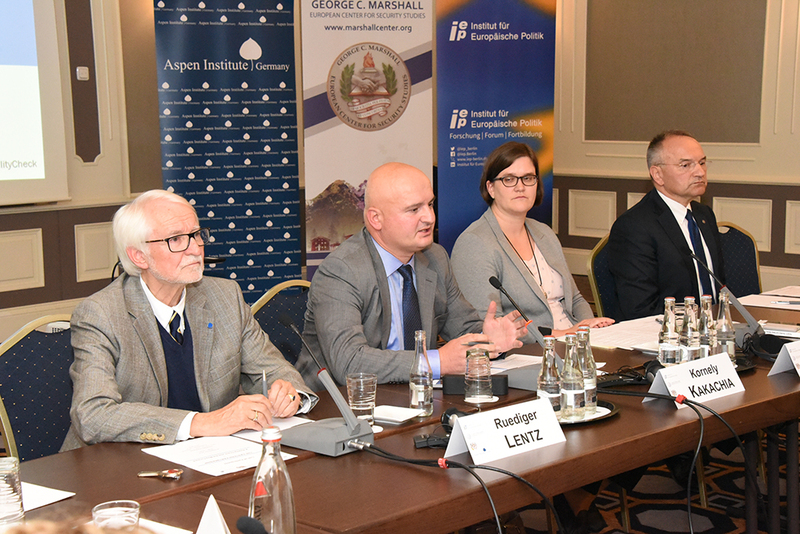 The debate consisted of two panels: the first panel focused on the challenges that Georgia, Moldova and Ukraine are facing while working on the reforms in the framework of Association Agreements. 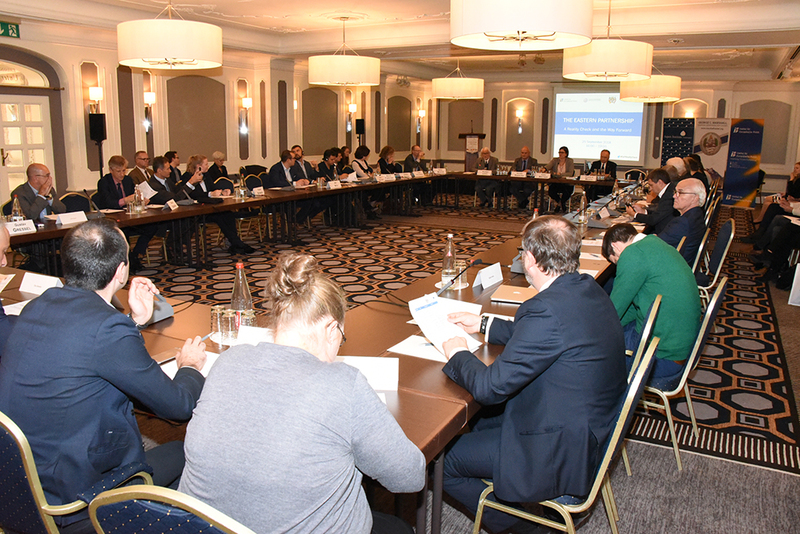 Speakers representing the civil society from the three countries sought to provide a realistic assessment (“reality check”) of the current situation in Georgia, Moldova and Ukraine, answering to the following questions: what is the state of play in regard to the EU Association process? Are the reforms on track? 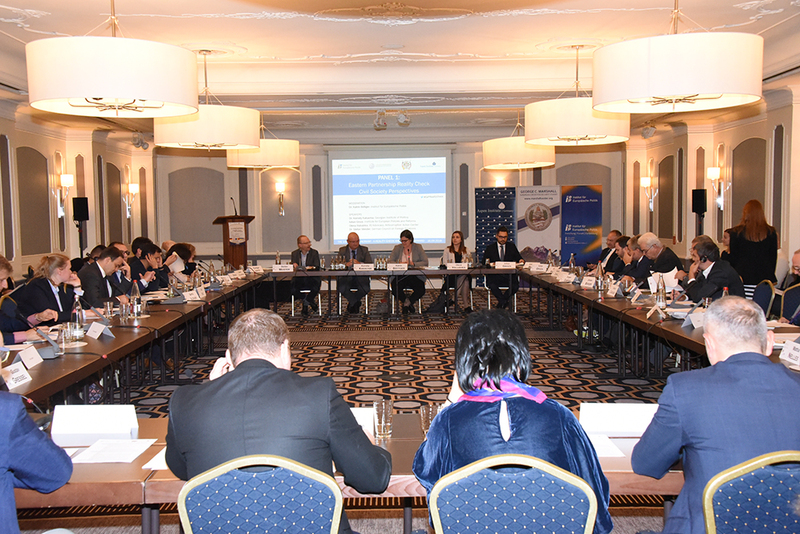 Furthermore, the panel served as a reality check of expectations: what do the EaP countries expect from the EU’s EaP policy and how realistic are these expectations from the European point of view? What should be the future of the Eastern Partnership’s format? The speakers included Dr. Kornely Kakachia, Iulian Groza (Director of the Institute for European Policies and Reforms, Moldova), Olena Halushka (Head of IR/Advocacy, Anticorruption Action Center, Ukraine) and Dr. Stefan Meister (Head of the Robert Bosch Center for Central and Eastern Europe, Russia, and Central Asia at the German Council on Foreign Relations). Dr. Katrin Böttger moderated the discussion. Kornely Kakachia stressed the importance of critical self-assessment, while acknowledging the institutional impact of the Association Agreement in Georgia. According to Dr. Kakachia, Georgia has been considered a “country in transition” since regaining independence, which developed into a state that can be better described as “protracted transition”. He named regional security as one of the biggest issues for the EaP countries, calling them “geopolitical orphans”, who found themselves in the “grey zone”. “Georgia is not member of any regional security organization and has directed all its energy to Euroepanization”, – said Kakachia. Iulian Groza spoke about the EU conditionality and the upcoming elections in Moldova. Signing Association Agreement in 2014 gave the country opportunities to advance taking advantage of EU integration, including the visa free regime, and high volumes of trade with the EU. However, banking fraud put Moldova on the first pages internationally, and challenged credibility of transformation, both among international partners, but also among citizens. EU applied strict conditionality, including political conditionality for the Macro-Financial Assistance (MFA) instrument in 2017. At the same time, the ruling party has changed their narrative, from pro-European to pro-Moldovan party, in light of the upcoming elections in February 2019. 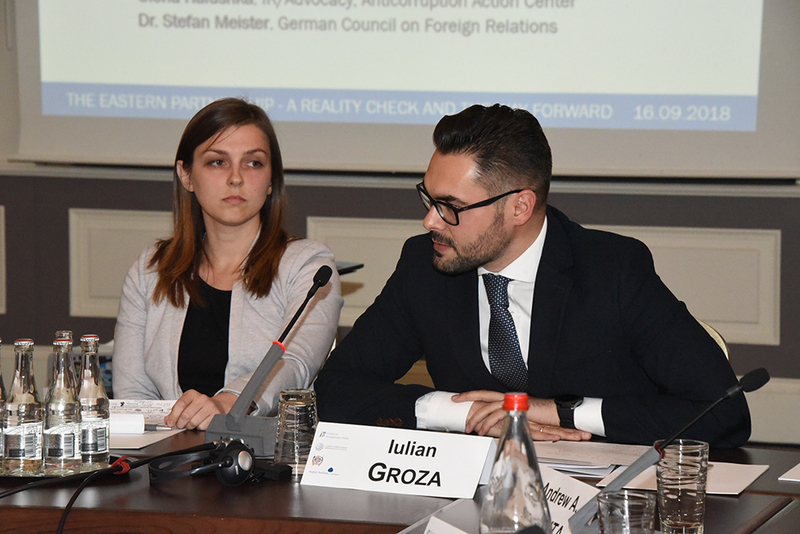 The pace of reforms and democratic reforms seems to be in decline, and the biggest challenge, according to Groza, is that the government provides fair opportunities for the upcoming elections. Ukraine has set an ambitious reforms agenda after revolution – but when the wealth of Janukovich was revealed, it was realized that Ukrainians need to focus on fighting corruption, spoke Olena Halushka. While Ukraine is one of the most transparent countries in Europe – most public registries are open to access data – the challenges start when attempting to bring corrupt officials to justice. As a recipe for success Halushka noted synergies of reform-oriented actors within the government, civil society and international partners, that have already brought fruits. 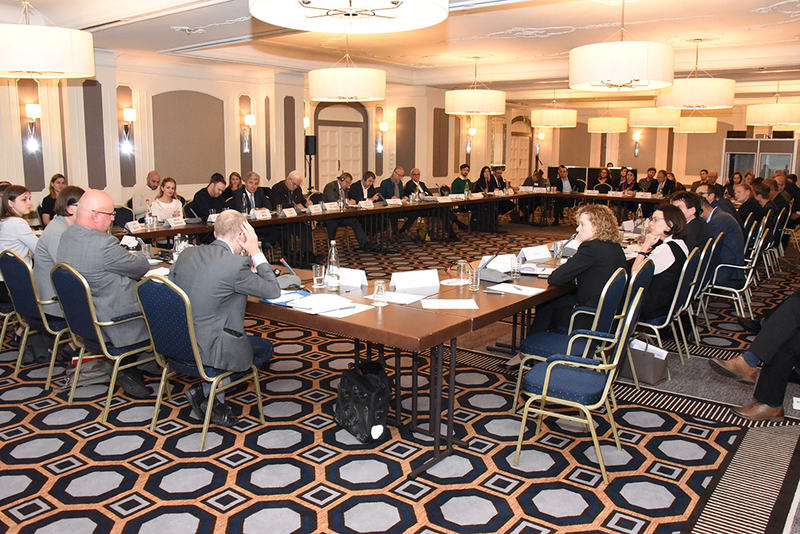 One of positive examples has been the creation of National Anti-Corruption Bureau of Ukraine (NABU), where civil society and public international council of experts were engaged in selecting judges, creating a more transparent process – NABU is now investigating over 500 cases. Stefan Meister assessed the Eastern Partnership policies of the EU, in light of internal and geopolitical challenges. 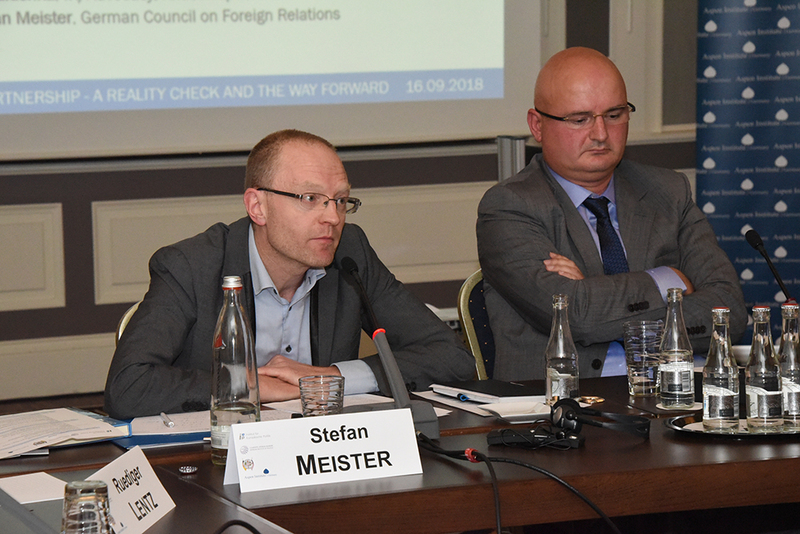 According to Meister, the EU is still lacking a neighbourhood policy that would reflect the reflect the EU interests and would also be attractive to the EaP countries. He called to prioritize areas of reforms, rather than trying to implement the whole AA at once, for the EaP countries to coordinate their actions, and for the EU – to have conditionality depoliticized and better calibrated, tailoring existing instruments for each of the EaP countries. 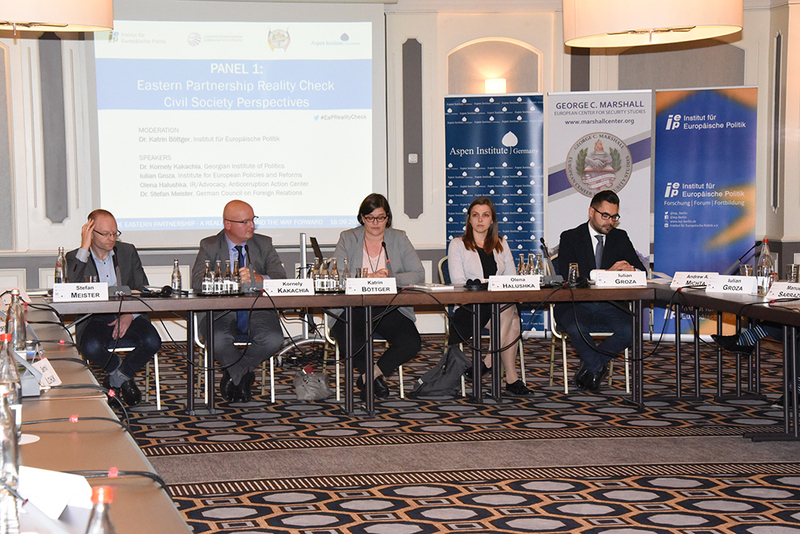 Based on the reality check conducted on the first panel, the second panel sought to look at the possible ways forward for the EaP countries’ domestic reform agenda and offered politicians and officials the opportunity to share their assessment of the Eastern Partnership as an umbrella policy. Contributions to the second panel were done by Members of Parliament and public officials from the EaP Association Agreement signatory countries, Germany and the US: Tamar Khulordava (Member of the Parliament of Georgia, Chairperson of the Committee on European Integration ), Eugen Carpov (Member of the Parliament of the Republic of Moldova, Chairman of the Committee on National Security, Defense, and Public Order), Oksana Syroid (Member of the Verkhovna Rada of Ukraine, “Deputy Chairperson of the Verkhovna Rada of Ukraine), Manuel Sarrazin (Member of the German Bundestag, Bündnis 90/Die Grünen, Member of the Committee on Foreign Affairs and Committee on the Affairs of the European Union), Dr. Bernd Forster (Head of Section for EU Relations with Eastern Europe, Russia, Southern Caucasus and Central Asia, German Federal Foreign Office) and Justin Wein (Deputy Chief of Staff, Congressman Price, House Democratic Partnership, U.S. House of Representatives). 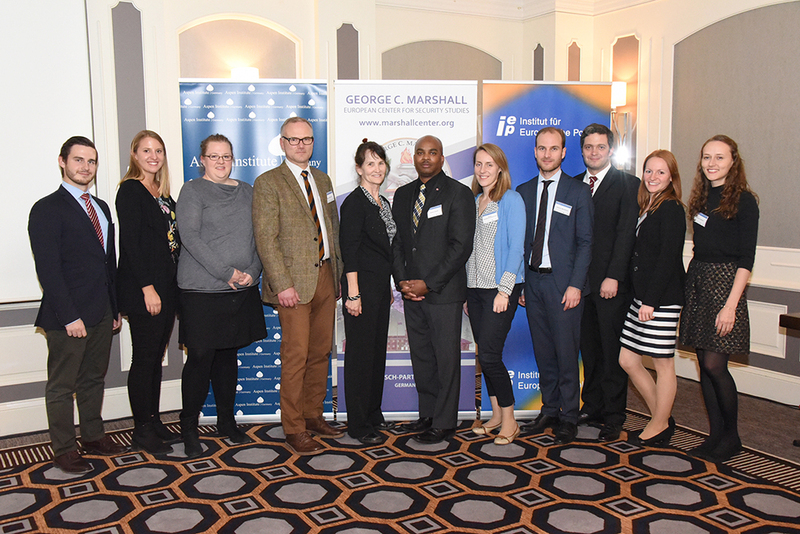 The panel discussion was lead by Dr. Valbona Zeneli (George C. Marshall European Center for Security Studies). 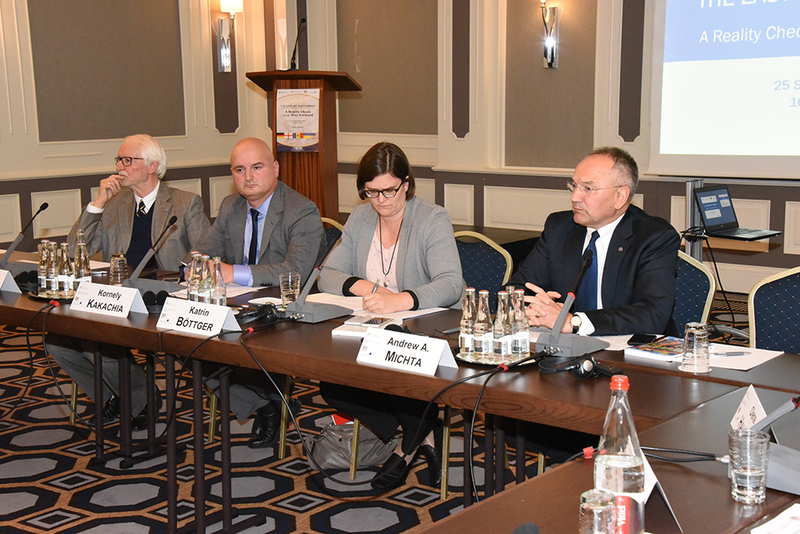 Eugen Carpov spoke about the need for increased cooperation in security and defense between Moldova and the European partners, especially to address the hybrid threats that challenge Europeanization. “When Russia attacked Ukraine, we felt more focus from Putin on Moldova too”, which included support to pro-Russian parties, especially in the break-away regions and increasing Russian propaganda, according to Carpov. He stressed the need to improve strategic communication and countering propaganda, at the same time working to fulfill commitments to the EU and maintaining political will to pursue the reforms. 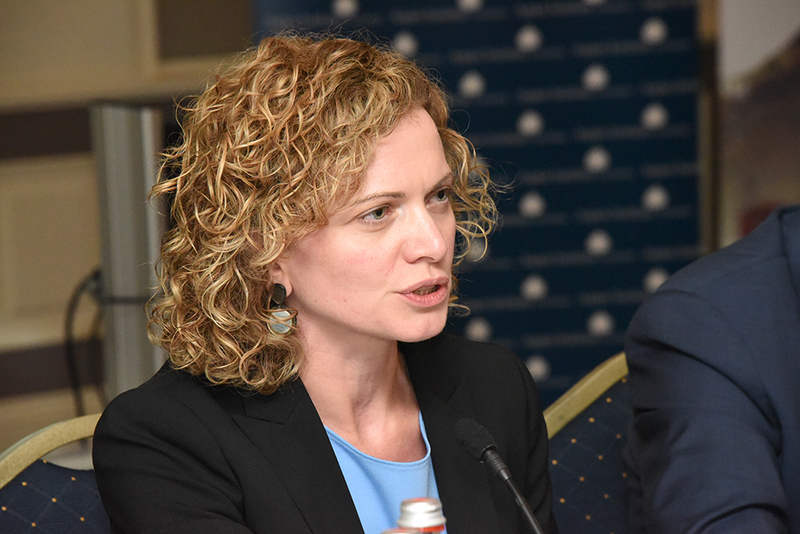 Oksana Syroid pointed out that the EaP was created to mitigate the notion that EU enlargement was not possible at the time. However, it is important to acknowledge the reality of EU aspirations by Ukraine, Moldova and Georgia. According to Syroid, Ukrainian reality is shaped by three notions: Russia – different attitudes to the role of this country (partner vs threat) create a challenge. Aggression – i.e., should it be interpreted as war or just a conflict? “If it is a conflict, we need to pacify the armies of Ukraine, Georgia, etc. If it is war, we need to strengthen them – it creates completely different approaches,” – pointed Syroid. Finally, oligarchy remains a challenge for Ukraine – and as Syroid noted, to challenge the oligarchs, Ukrainian government needs to implement anti-trust regulation (with the help of EU/US), protect critical infrastructure from corrupt money, and to sanction Russian money. Continuing on the topic of attitudes towards Russia, Manuel Sarrazin explained that in Germany, sometimes it is understood as competitor, sometimes – difficult partner. But realization about the challenges that Russia poses is coming step by step – even those who have been fighting for engagement, partnership with Russia, “are not as enthusiastic anymore”. At the same time, Germany supports the reforms in the Eastern Neighborhood to strengthen the soft power of the EU, which is needed to counter China in the region. EaP was designed to be a technocratic instrument to promote economic development. What is lacking in creating stability – EaP is not delivering on security issues, leaving it for NATO. Another challenge for the EaP countries now is the fatigue about enlargement within the EU. The question “What is next, after visa free regime?” was asked in the Balkans too. 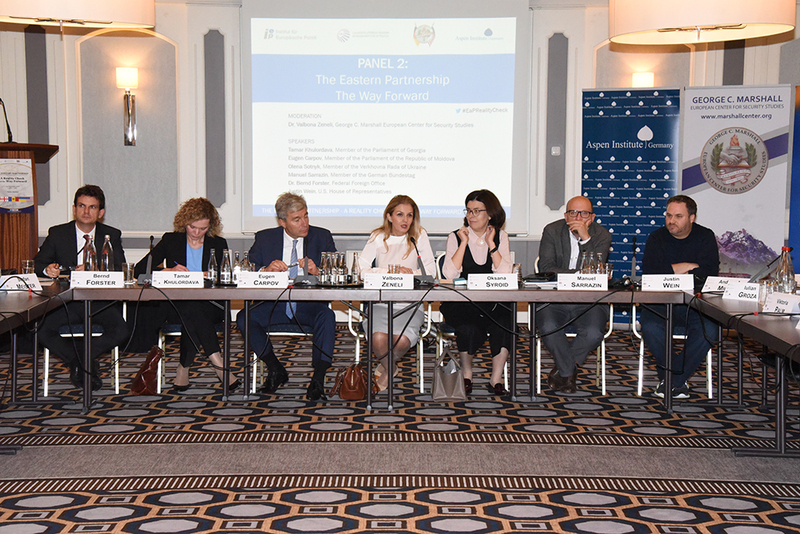 The only way to fill the gap in strategic partnership with the EaP countries is enlargement promise – which EU is not courageous enough to do now. Bernd Forster focused on the policies that have been driving EaP framework, namely the two pillars on which EaP was built: democracy and rule of law; and economy. These policy areas were embedded in the last EaP Summit in Brussels in 2017, when it was decided to focus on areas with concrete achievable goals – thus, setting 20 goals for 2020. 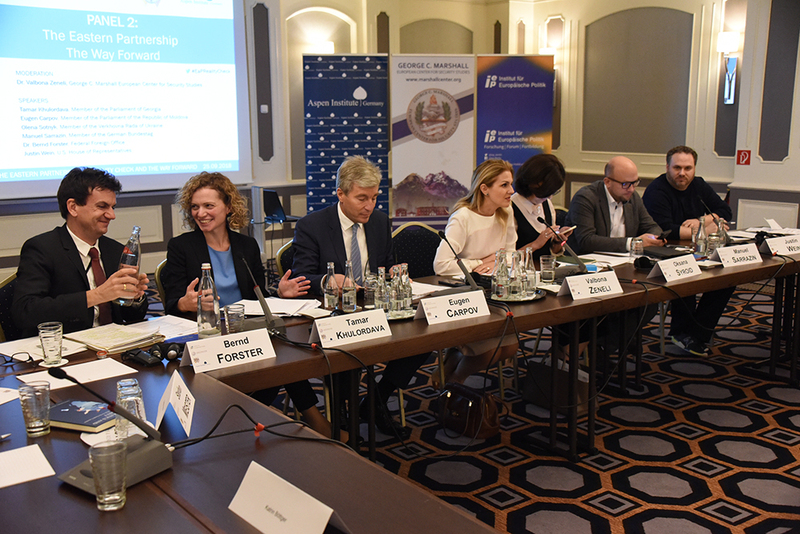 Forster emphasized that among the many challenges, there are many positive developments that need to be acknowledged, such as Erasmus+ programs, newly opened European school in Tbilisi – “these and other concrete steps are the way forward for closer integration”. 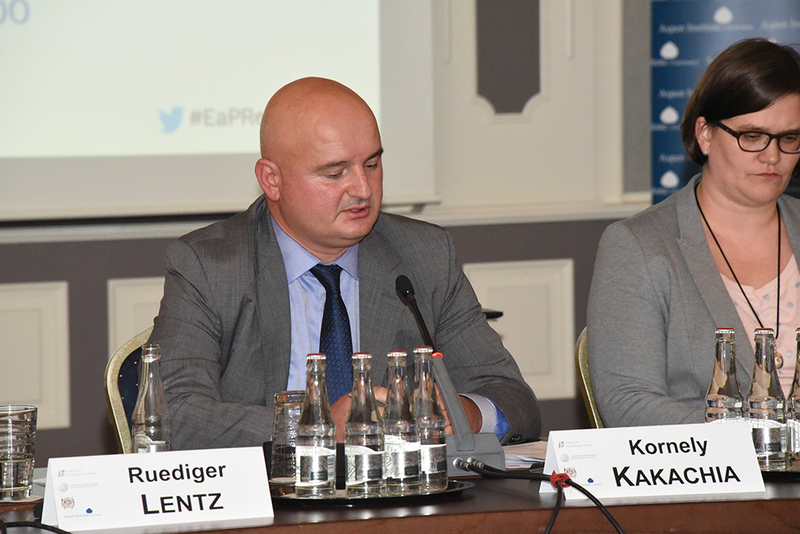 The second panel also offered an American perspective, putting EaP in a broader context: Justin Wein pointed, that the US Congress regards EaP important region for stability, and has shown broad support by controlling the budget allocations for USAID and other support. “Congress views the stability of these countries as part of strategic interest, and economic interest, and we want to be present – but we also want the local governments to step up their game a little bit,” – said Wein. Geopolitical landscape in the world is shifting, with challenges of populism rising both in Europe, and in the US. When talking about EaP, the governments should deliver not only on defense, or infrastructure. It is about looking past political rivalries, not prosecuting political opponents, having independent judiciary that supports and safeguards democratic values. “Democracy is not only about having free and fair elections, it’s about what happens between elections”.